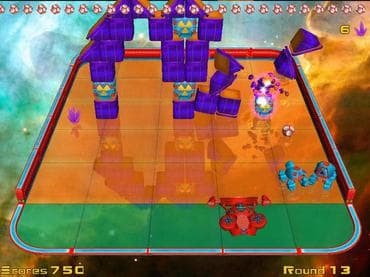 Turboball is a highly addictive Arkanoid remake that won't let you go outside for at least a week once you install it.Unlike other Arkanoid clones, Turboball prides itself with professional 3D graphics, studio-level sound effects, awesome original soundtrack and well-designed gameplay with tons of new brick types, bonuses and special effects. The point of the game is to destroy all the bricks the level is comprised of using the rockets. Sometimes you will get bonuses for destroying the bricks. Those bonuses can be good ones - bullets, magnets or rockets, for example, - and getting them will help you to pass the level, or bad ones. Not only does it have tons of new brick types, bonuses and special effects, the game now includes an option of recording and loading. Download free full version game today and start your brick bursting fun! If you have questions about Turboball game, please contact us using this form.